Gaian Tarot Retreat going like hotcakes! Out of the 36 spots for our Gaian Tarot Retreat in October, seven spots are already taken. Wow, people are fast! A few days ago, I received my copy of the Tarot of the Sidhe, a pack of cards by Emily Carding. Sidhe (pronounced Shee) is a Gaelic word that refers to the realm and beings of Faery/Spirit/Otherworld and this deck of radiant images conveys that flavour. The Tarot of the Sidhe is structured traditionally: 22 major cards and four suits of 14 cards each. Justice and Strength are numbered in the continental manner with Justice as VIII and Strength as XI. The Hierophant or Pope has been renamed the Elder and the Devil has been renamed Pan since, in most pagan worldviews that I’ve encountered, there is no ultimate earthly spiritual authority and there is no such thing as an ultimate source of evil. The majors’ numbers appear at the top of the card and their names appear at the bottom. Court/People cards are called Princess, Prince, Queen, and King. The four suits are named differently in accordance with a Knowing that Carding received one day in her kitchen. The Air suit is called Dreamers instead of Swords. The Fire Suit’s name is Warriors in place of Wands. Dancers, rather than Cups, make up the Water suit. And Makers, instead of Pentacles, carries the Earth energy. At the top of each minor card is the card’s name and on the bottom is a key word or phrase. Executed in ink and watercolour, the Tarot of the Sidhe‘s pictures swirl with multiple hues and visionary themes. They are immediately appealing and engage my imagination, intuition, and creativity. This deck is most definitely NOT a Rider-Waite-Smith wannabe. Each image is framed by a black border, providing (for me) a sense of focus, a sort of doorway through which one can enter the scene. There’s a sense that the artist really entered the Sidhe and imported some pictures back with her. The backs of the cards are black with a white spiral known as the Great Glyph of the Sidhe, itself a potent tool for reflection and discovery. This symbol also appears in every major arcanum. Last night, I took a shamanic journey with the intent to find out what the Glyph can teach me. I was told that it can be a portal to my multi-dimensional self/selves and multiple dimensions. It’s also a pathway to the centre of my soul, a route to my Core True Self. The accompanying booklet is extremely helpful. It’s not the usual collection of blather that one sees about “this card means that”. For each card, Carding provides a poetic oracular utterance before one even reads a single card meaning — beautiful! These prophetic phrases can act as divinatory messages or the starting point for spoken ceremonial text. Each major arcanum is also given an Artist’s Note that describes what the image is about and even a bit about the process of drawing and painting. Useful layouts are also contained in the booklet (thank Life that the celtic cross spread doesn’t rear its head here!). There’s also a section on meditation and other uses with the cards. I asked the Tarot of the Sidhe a question about itself: What is your true purpose? After I mixed the cards, it responded with the Warrior Ten (its traditional equivalent would be the 10 of Wands). Who thinks of the sacrifice as they cross? Who weeps for knowledge of the bridge’s loss? I heartily recommend the Tarot of the Sidhe as a tool for deep divination, personal discovery, and making dynamic shifts. If you enjoy using the tarot and feel a pull “to the waters and the wild” (Yeats’ words) of Faery, you’ll want to own a set of these cards. If you’d like to try them during a consultation with me, I’ll be very happy to pull them out and use them for your session. Stylish Blogger Award for Circle Ways! Today, I received the Stylish Blogger Award from Janet Boyer. What a delightful surprise! Heartfelt gratitude to Janet for this. 1. Began to use the tarot at age 12. It’s a key tool in my life and work. 2. I LOVE circle process and ways that are rooted in it. 3. Cooking is a relaxing pastime for me (and eating!). 4. I live in a lovely tree-filled neighbourhood in Toronto, ON. 5. My Tarot for Manifestation book is due to come out from Tarot Media Company very soon. 6. I’m a openly man-loving man. 7. I derive great satisfaction from writing blog entries and reading people’s comments. There are many more wonderful bloggers out there. Thank you all for keeping the web of connection vibrating. Love Earth? Love Tarot? Join us! There’s a very cool retreat taking place this October and you need to be there! There is so much to these. They, like so much else that I recite, are a way of life, not just words. They are so rich that I encourage you to read the book. Christina even has a free downloadable study guide available for groups ( http://www.peerspirit.com/gifts/Seven-Whispers-StudyGuide.pdf ). So please gather your fellow journeyers and explore these subtle yet powerful phrases together. This phrase came to me as a result of several influences. First, my primary “serious” tarot book, back in the 1980s, was Choice Centered Tarot by Gail Fairfield. Not only did it teach me about tarot, it opened up a way of life to me that was about living by choice rather than by fate. It’s a book that’s less about predicting a set outcome and more about noticing what’s here in the moment so that one can be aware of the options that are present. When one can see the options, one can make cleaner, healthier choices, should one choose. Second, reiki is more than a hands-on energy modality, although that’s a part of it. It’s a way of life that includes living “for today only” — i.e. in the present moment — as much as possible. If we’re living in the now, we’re less likely to get attached to what has been and what has not yet happened (and probably won’t happen); therefore, less stress and more health. 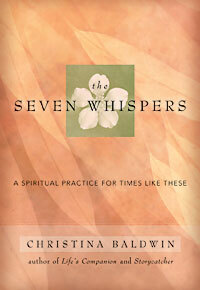 Third, participating twice in a study circle about The Seven Whispers by Christina Baldwin brought me to a realisation that what many practices are about are staying in the moment and being conscious of what’s here now. From that place of awareness, we can create our lives rather than wait for them to happen and we can choose our responses to the unexpected rather than react to them. All of this isn’t to say that I’ve perfected presence and consciousness. Note that I still recite, “Be present; choose consciously” every day as a reminder to self. to allow the world to contribute to my healing. These words invite a flow of healing thoughts, words, and deeds from me to Earth and all of her inhabitants. They also remind me to be open to whatever life-giving things are available to me in every moment. They’re not just words, they’re a practice rooted in being part of the council of Life. This reciprocity is delicious and enlivening.